Ingersoll Rand builds more types and sizes of air compressors than any other manufacturer. We provide you with a broad selection of standard units to meet your requirements. In addition to our own in-depth inventory of genuine Ingersoll Rand replacement parts, we have direct access to Ingersoll Rand's sophisticated worldwide parts network. Through our proprietary system we can locate within minutes, even the most obscure or dated part. Prices, shipping data and schedules are established immediately. When your need is critical, we can access emergency overnight delivery. The addition of appropriate accessories lets us adapt our compressed air systems to suit your special needs. Filters, air coolers and dryers may be used to fit standard models for any number of applications in a wide variety of industries. 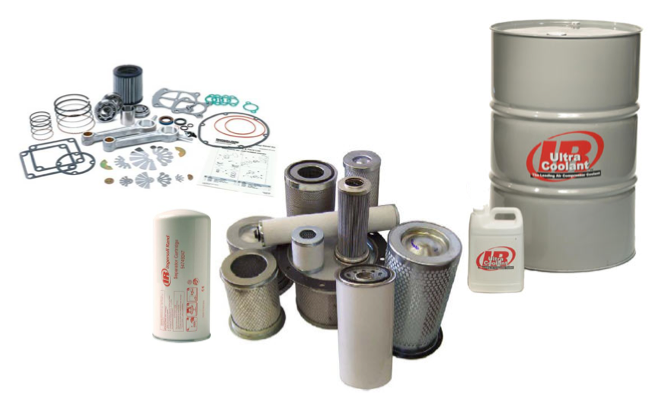 Ingersoll Rand accessories are manufactured to the same tough standards and tight specifications as Ingersoll Rand air compressors. As a result, you are assured of optimum performance from your total air system. Compressed air rentals are available 24 hours a day, 7 days a week whether your needs are on an emergency, temporary or standby basis. Please contact us with your needs as our extensive inventory of used air compressor equipment changes daily.